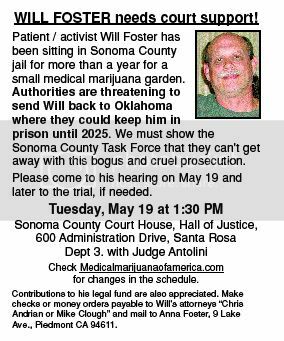 Patient and activist Will Foster has been sitting in Sonoma County jail for more than a year for a small medical marijuana garden. Authorities are threatening to send Will back to Oklahoma where they could keep him in prison until 2025. We must show the Sonoma County Task Force that they can’t get away with this bogus and cruel prosecution. Please come to his hearing on May 19 and later to the trial, if needed.